WR: First of all, tell us a little about yourself. Chipzel: My name is Niamh (pronounced like Neeve) Houston, I'm from a small town in Northern Ireland called Strabane, and I've been writing chiptune/ 8bit since I was 16 years old. I'm now 21 and living in Liverpool and still working independently under the artist name Chipzel. WR: I've been really impressed by how well your music fits in with the gameplay and graphical style of Super Hexagon. How did you and Terry Cavanagh start working together in the first place? Chipzel: Well basically, a few months ago, Terry got in contact asking if he could use one of my tracks (Courtesy) for a Flash game he was making called Hexagon. Apparently, he'd been listening to it while developing the game, and thought it fit perfectly. He sent me a preview of it, and I thought it worked really well together, so I was happy to jump on board. After a few months, I received an email from him saying he was making an extended version of the game, and wondered if I would do some tracks for it. So we ended up with the three tracks from the Super Hexagon EP, which worked like a charm. It was lovely to work with him, and I'm really excited to see what else he comes out with in the future. WR: Follow-up: What was the creative process like? How'd you design the songs for Super Hexagon, especially so that they'd mesh so well with the game? Chipzel: I've always loved the idea of writing music for games, especially retro-style games that are more arcade like, since it fits the genre so well. I had some songs that were already in the making and Terry knew exactly what he wanted for the game, so it was easy to compile the three tracks. Props go to Terry for how well it fitted together. WR: What are your thoughts on chiptune creation in general? Do you feel limited by the genre or does it allow you to express your musical ideas more easily? 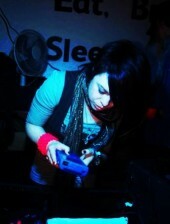 Chipzel: I absolutely love chiptune and everything about it. It's such a fun way to create music, and the limitations of what you can do, can actually make it more challenging. Over the past few years, I've experimented with different ways of making music, but always came back to what I know. I've never actually studied Music Theory, so I go by what sounds good to me, and using LSDJ from a young age allowed me to write music without needing to live up to any kind of standard, but just do my own thing and enjoy it (Writer's note: For more info on LSDJ, go here). WR: Why did you decide to make chiptune in the first place? Any artists that really inspired you? Chipzel: I'd always loved the gameboy sounds, I remember I used to just sit listening to the Tetris soundtrack when I was really little, without actually playing the game. Then I heard about Sabrepulse from searching Myspace for new music, and was absolutely blown away. The 8bit sound is just so raw and melodic and beautiful. WR: How has the live element of your music worked for you? Does your DJing differ from more standard electronic DJing? Chipzel: It's pretty much the same setup, really. I use a mixer and two gameboys, with a few copies of LSDJ. When playing live, it's just a matter of triggering the created samples and adding in effects, buildups and breakdowns. WR: What's been your favorite gig so far? Chipzel: Definitely Blip Festival in New York. It was incredible to be asked to play the show and amazing to meet other artists in the chip-scene. I also used to play local gigs in Derry, N. Ireland in the Nerve Centre, which were always crazy and very fun. WR: If you could play at any venue in the world, where would you go? Chipzel: Amnesia, Ibiza, without a doubt. I've been there and seen some acts and it's such an amazing venue. (Laughs) I can't say chiptune would fit the scene, but if we packed it full of chiptune lovers, we would have the best party ever. WR: On a related note, if you could do a collaboration with any artist, which one would you pick? Chipzel: I have actually got plans to do some collaborations with some chip artists this year, if all goes to plan. Outside of the chip scene though, I'd say Deadmau5. WR: Thanks a ton for your time. One last question: if you could pick any superpower, which one would you pick? Chipzel: The ability to time travel, so I could go back and stop Justin Bieber from happening. Again, her Super Hexagon EP is out on Bandcamp here.